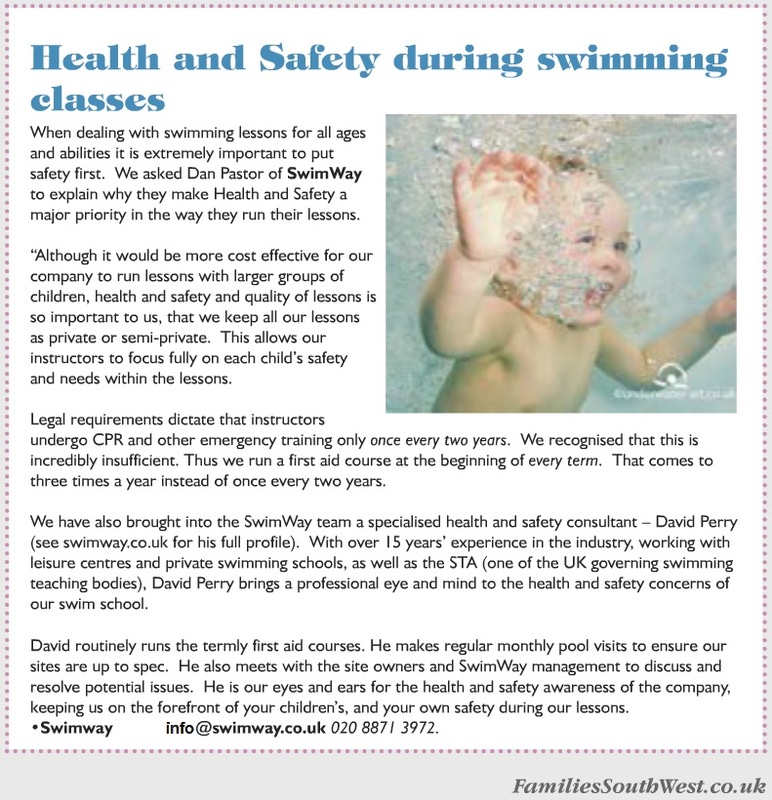 SwimWay's founder Dan Pastor sat down with Families South West Magazine to talk about the SwimWay's commitment to the safety of our London swimming lessons. SwimWay’s founder Dan Pastor sat down with Families South West Magazine to talk about the SwimWay’s commitment to safe swimming lessons. When dealing with swimming lessons for all ages and abilities it is extremely important to put safety first. We asked Dan Pastor of SwimWay to explain why they make health and safety a major priority in the way they run their lessons. Legal requirements dictate that instructors undergo CPR and other emergency training only once every two years. We recognised that this is incredibly insufficient. Thus we run a first aid course at the beginning of every term. That comes to three times a year instead of once every two years. We have also brought into the SwimWay Team a specialised health and safety consultant – David Perry. With over 15 years’ experience in the industry, working with leisure centres and private swimming schools, as well as the STA (one of the UK governing swimming teaching bodies), David Perry brings a professional eye and mind to the health and safety concerns of our swim school. David routinely runs the termly first aid courses. He makes regular monthly pool visits to ensure our sites are up to spec. He also meets with the site owners and SwimWay management to discuss and resolve potential issues. He is our eyes and ears for health and safety awareness of the company, keeping us on the forefront of your children’s, and your own safety during our lessons.